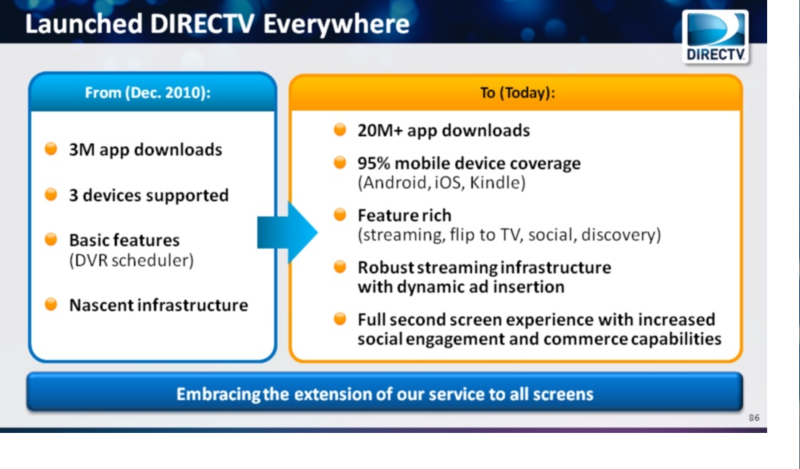 DIRECTV’s Investor Day is going on now and we’re watching the live feed. We’ll be posting updates during the day that are being shown. Keep refreshing the page and we’ll post updates as we have them. First off, we’ve heard that DIRECTV is showing a demo of 4K and we are also expecting the formal announcement of the C41 wireless client! Mike White is crowing about accomplishments. We’ll post the slideshow as soon as it’s available and if there’s a good slide, we’ll do a screencap. NOTE: Oh dear, the person who is putting the slide together used an obsolete dish for the “Advanced Technology” slide. So… contextual search, that’s new. And now it’s Bruce Churchill. It looks like we’ll be in for about an hour of Latin America results. That’s really interesting financially but we’re not likely to see anything new technology-wise. By the way, Mr. Churchill really likes to over-pronounce the word “Panamericana” as he has already demonstrated. We’re continuing with Latin America coverage, not a lot interesting for the average techie here in the US. Ever wonder what a Genie looks like in Brazil? They call it the NEXUS DVR but it looks pretty much the same. DTVLA news continues… now they’re talking about wireless broadband. And… moving along briskly to the Latin America financial outlook. Things look really rosy there, but we’re holding our breaths waiting for Chief Technology Officer Romulo Pontual’s talk about new US technologies. When we come back from their break in about 5 minutes, Mr. Pontual will be speaking about technology in the US. Yay! We’re back and Mr. Pontual is preparing to take the stage. We’ll liveblog this part as much as possible. 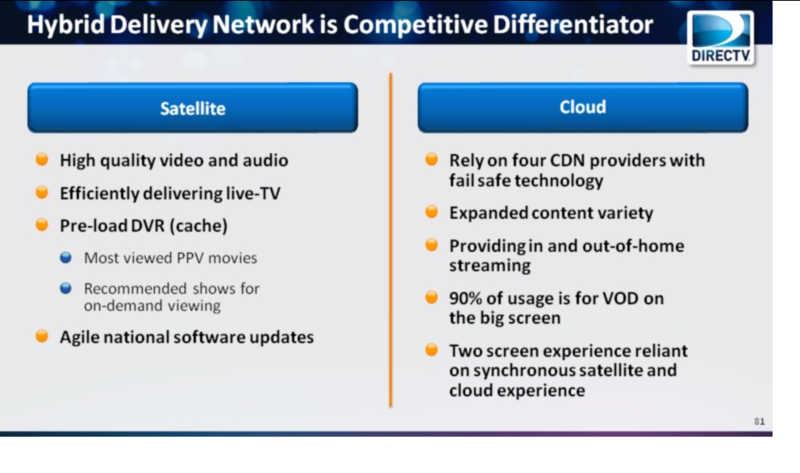 Wants to leverage the combination of cloud and satellite service. Also mentioning Ultra HD (4K) very early. Distribution technology is roughly twice the size of the internet. Two satellites under construction now. VOD is going to a 100% cloud-based UI. 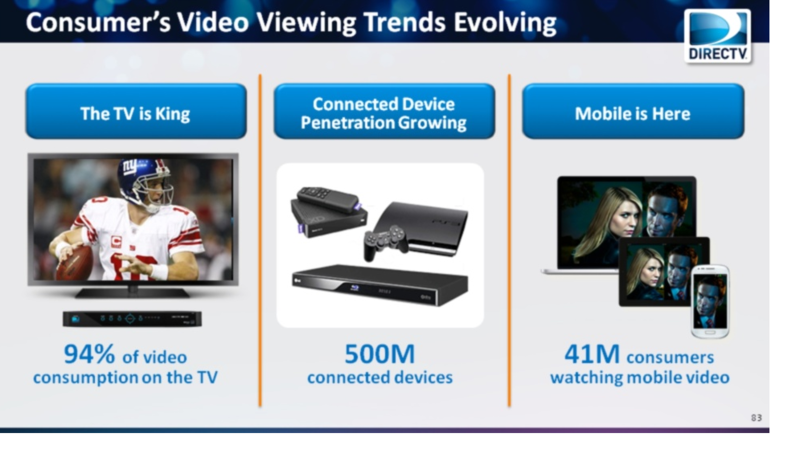 Customers tell us, they want to watch TV on a TV, not as much mobile. Connected homes is up 4x since 2010. Genie is the best DVR with the best search and recommendation engine. Going deeper in detail on streaming. Creating revenue for content providers with ad insertion. Now talking about improving NFL, improved quality of live streaming, instant highlights, fantasy football integration, and other features. Preparing to launch “Startover/Lookback” which is rumored to be technology that will allow you to watch any program on selected channels from the beginning even if you join in progress and are not recording. Talking about delivering on promises: New UI, new interface across devices, Best search, and upgrades to social integration. Which is better… a second SWM off the same dish, or a second dish? Make your DIRECTV guide faster with this tip!